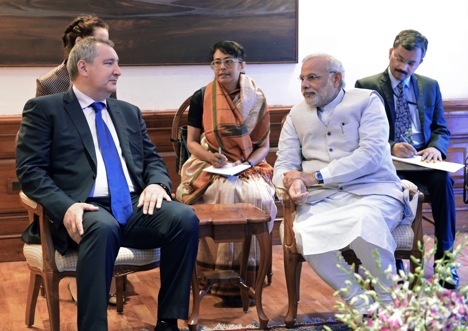 Both Sushma Swaraj and Narendra Modi chose to speak with Dmitry Rogozin in Hindi, instead of English. The new leadership of India used Hindi during the official meetings with Dmitry Rogozin last week. A source close to the negotiations said that the meetings on June 18-19 were conducted in Hindi and Russian. Indian External Affairs Minister Minister Sushma Swaraj used the Hindi language during a meeting of co-chairs of the Indo-Russian Inter-Governmental Commission on Trade, Economic, Scientific, Technological and Cultural Cooperation (IRIGC). Prime Minister of India Narendra Modi, who has chosen to use Hindi with all foreign dignitaries, spoke to Rogozin through an interpreter in Hindi. Diplomats from the Russian Embassy served as translators for the meetings. Tatyana Kopylova and Yulia Aryayeva, graduates from the Institute of Asian and African Countries (IAAC) at the M.V. Lomonosov Moscow State University (MSU) and the International Relations Department of the Moscow State Institute of International Relations (MGIMO) respectively were the Russian translators. “We were pleasantly surprised by their level of mastery of Hindi,” said one interlocutor. At the same time, another source who attended the meeting, said that this innovation led to the negotiations taking almost twice as much time to complete. “One feature of Hindi is that simultaneous interpretation of this language is virtually impossible, which leads to an increased duration of the negotiation process,” he explained. Narendra Modi had already previously communicated in Hindi with colleagues from the South Asian Association for Regional Cooperation (SAARC) who attended his inauguration ceremony on May 26. Among them was the President of Sri Lanka Mahinda Rajapaksa, who doesn’t understand the language. Modi followed in the footsteps of former Prime Minister Atal Bihari Vajpayee, who held the post from May 16, 1996 to June 1, 1996 and March 19, 1998 to May 22, 2004. He spoke in Hindi with the leaders of non-English speaking countries, including Russia and China. However, with English-speaking politicians, Vajpayee still spoke in their language. Modi may just have created a precedent for the future Indian leaders. Russian Ambassador to India Alexander Kadakin, who has had many diplomatic postings in the country in a span of over 25 years, also served as interpreter for the USSR when Vajpayee was India’s External Affairs Minister of the Moraji Desai government in the late-1970s, a source told RIR.